Properties in Bourgogne-Franche-Comté average 4.6 out of 5 stars. The Little House of Lovers at 1:30 of PARIS quiet. 11km from Sancerre. Property 2: The Little House of Lovers at 1:30 of PARIS quiet. 11km from Sancerre. Detached chalet, very well located in a very quiet set of 29 chalets. Property 4: Detached chalet, very well located in a very quiet set of 29 chalets. Burgundy, cottage in wooden chalet near Vézelay. Property 5: Burgundy, cottage in wooden chalet near Vézelay. Very nice small chalet, with a cosy interior in a very quiet area. 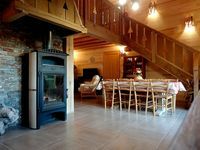 Property 32: Very nice small chalet, with a cosy interior in a very quiet area. Detached chalet - 5 people - 800m from the hedgehog waterfalls - Free Wi-Fi - Chalet N°1 "L'éventail"
Property 42: Detached chalet - 5 people - 800m from the hedgehog waterfalls - Free Wi-Fi - Chalet N°1 "L'éventail"
Detached chalet - 5 people - 800m from the hedgehog waterfalls - Free Wi-Fi - Chalet N°4 "Le Lynx"
Property 48: Detached chalet - 5 people - 800m from the hedgehog waterfalls - Free Wi-Fi - Chalet N°4 "Le Lynx"
Ideaal voor rustgenieters en natuurliefhebbers. The cottage is situated at a beautiful location, the lake is nearby and great for swimming. It was a very quiet location with a very friendly owner. The cottages had all the facilities we were expecting. The only drawback was that there was a lot of housedust, which caused health problems.